A legion of young guns from the DC Universe are ready for their time in the spotlight! 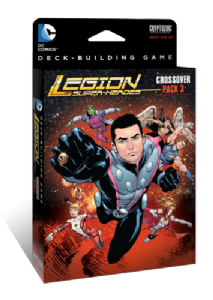 In DC Comics Deck-Building Game: Crossover Pack 3 – Legion of Super-Heroes, play as a founding member of the Legion of Super-Heroes: Lightining Lad, Saturn Girl, Cosmic Boy, and more! Take on Super-Villains like Time Trapper, Emerald Empress, Persuader, and many others. Find interesting new Heroes, Villains, Equipment, Super Powers, and Locations in this set as well. This set features an exciting new keyword called "Time Travel", and all but one card in this set has it. A Time Travel card can be played while in the Line-Up or on the Super-Villain stack at the cost of discarding a card from hand...but then you can't buy or gain that card that turn! Time Travel creates a lot of new and interesting decisions for players to make each turn.